Jonsson was key in saving Saab. Saab owner Spyker Cars N.V. is looking for a successor to long-serving Saab CEO Jan Ake Jonsson, who will retire on May 19. Jonsson, 59, played a key role in saving Saab when former owner General Motors Co. wanted to close the Swedish brand. Saab Chairman Victor Muller will temporarily assume the additional role of Saab CEO until a replacement for Jonsson is found. Replacement candidates for Jonsson "are definitely from the industry," Muller told reporters today. "It would take too long for someone who's not from the industry to understand how it really works in a car company, let alone Saab." Muller said Jonsson was instrumental in Saab's survival and in its transition into an independent car company. "I am really sad to see him leave, but understand and respect his rationale. He has had one of the toughest jobs in Sweden in recent years and I am grateful that he has transferred his knowledge and experience to the managements of Saab and Spyker." Eric Geers, Saab's communications head, said Jonsson had been planning to retire for a number of months after working day and night on the brand's future. Jonsson had become a "symbol for not giving up -- not only for Saab but for Sweden as well," Geers told Automotive News Europe. Jonsson leaves Saab during a critical period. The money-losing brand has struggled to raise sales since it was purchased by Spyker from GM in February 2010. Jonsson has agreed to assist Saab's management with a smooth transition to his successor and will remain available to help until Sept. 1, Spyker said. 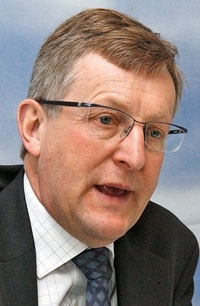 Jonsson has worked for Saab for almost his entire career of 40 years, including nearly six years as the head of Saab. "The last three years have of course been very demanding and forced me to focus on one thing only -- my work. Now it is time for me to also spend some time on other things that had to stand back for my duties to Saab," he said in a statement. Jonsson added: "I am convinced that Saab is on the right track toward replacing the entire product portfolio by October 2012 -- when the next generation 9-3 will be launched -- as well as creating a stand-alone company with a financially sound business model." Jonsson, a Swedish native, joined Saab in 1973 after studying business administration. He rose through the ranks, including stints as director of aftersales and service and two years as head of sales and marketing for Saab USA. He won widespread respect in his home country and throughout the industry for his leadership when GM, which was emerging from bankruptcy, said in December 2009 it would close Saab. The announcement came after potential sales to Koenigsegg Group AB and then Spyker fell apart. Two months later GM and Spyker finally negotiated a deal. Geers said the collapse of those earlier deals felt like two deaths. He credits Jonsson with being able to keep moving forward. "To survive that takes someone special," Geers said. Martin Crum, an analyst at Amsterdam's Effectenkantoor BV, said finding a replacement for Jonsson will be difficult. The resignation is "absolutely a negative," he said. Analysts say Spyker needs a long-term strategic investor to restore Saab's fortunes. On Friday, Spyker reported a 2010 net loss of 218 million euros ($309 million) and said 2011 also would be a loss-making year. Spyker did not reiterate its forecast for Saab sales to reach 80,000 this year and 120,000 in 2012. It said it was confident the increasing sales momentum of 2010 would "continue to build throughout 2011 and 2012." Saab sold 31,696 cars in 2010, up 15 percent from the year before. Spyker said it expects to generate a profit in 2012.